This venerable company was established in Florence in 1860, by Giovanni Panerai and his family. Their initial specialization was to produce precision instruments for the Italian Navy. Thus, it was natural that Panerai developed an interest in watchmaking for the commandos. As early as 1930, they had an exclusive contract with the military and provided watches, torches, and aiming sites for torpedoes. Panerai's loyal commitment to equipping the Italian Navy marine commandoes led to many impressive creations and patents. However, it wasn't until 1993 that these creations were made available to the general public. 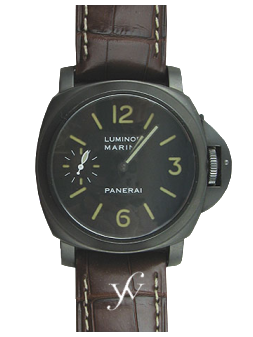 * During WWII, Panerai developed the Radiomir, which used radium, and the Luminor, which used tritium. These were state of the art pieces at the time and have been improved upon repeatedly over the years. * Part of the popularity of Panerai comes from their limited edition lines. As the company gradually became known on the world market, the sought-after limited editions were a way to slowly introduce the public to these fine timepieces. * The platinum Luminor uses the original Rolex movement. * Even to this day, Panerai maintains a close association with the Italian marine forces, continuing to meet their strict technical requirements. Radiomir 8 Days This fine masterpiece comes in a steel and rose gold version. It has a hand-wound mechanical movement that boasts a power reserve of 8 days. The indicator of the power reserve is viewable through the sapphire crystal back. The finishing is enhanced by a Côtes de Genève decoration and burnished blue screws. This movement has 33 jewels and a balance spring that is adjusted by a micrometer screw regulator. Luminor GMT Arktos This spectacular beauty is a technological wonder, used by Mike Horn on his Arctic expedition. By pointing the hour hand at the sun, north can be determined midway between the hour hand and 12 o'clock; this gives the position for setting the rotating bezel with the four cardinal points that are applied in relief. By using the 24-hour dial, the Luminor GMT allows the wearer to identify north with ease. This watch comes in stainless steel and is equipped with a Panerai OP VIII Calibre movement, with a 42-hour power reserve. The date aperture is at 3 o'clock and the watch is water-resistant to 300 meters. Panerai Luminor Marina This watch takes the basic Luminar model and adds a COSC cert chronometer and sub-dial seconds hand. It is also available in left-hand versions. The Marina has a steel band, steel case, white dial, and date calendar. Note: a submersible version is available with a ratcheted, unidirectional bezel.